"Stimulus Music" is a new project via Chicago music promo company JMA designed to promote both the local music scene and independent businesses in the city. 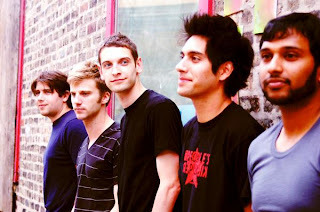 The project will officially kick off this Friday, August 28, with a showcase at Beat Kitchen featuring Loyal Divide, Blah Blah Blah, Le Concorde and Vince P.
Stimulus Music is the combination of Chicago artists and local businesses aiming to boost the city's culture. This is the first concert that promotes the tight-knit community of Chicago and our music scene while bringing optimism to the current economic situation. HOW WILL STIMULUS MUSIC ENCOURAGE CHICAGO? Upon arrival, guests will receive a discount card that will be valid for one month. This card has exclusive downloads from the bands performing and will also include special offers from celebrated businesses that make Chicago so unique. WHAT BUSINESSES OFFER DISCOUNTS ON THE CARD? WHAT ARE THE DISCOUNTS ON THE CARD? WHAT ELSE WILL I RECEIVE BY ATTENDING THIS SHOW? 312UNES - There will be a 312une's rep that will buy drinks and give out Goose Island merchandise. WHO ARE THE BANDS PLAYING THE SHOW? LE CONCORDE  Carves new territory in indie-pop by merging intricately woven synth kaleidoscopes with stark, songwriter elements. BLAH BLAH BLAH  This underground sensation continually wins over hearts for their emotively driving, and upbeat songs that playfully strike a balance between organic instruments and electronic elements. LOYAL DIVIDE  Using melodic electro-beats, Loyal Divide wanders effortlessly between raw industrial beats, lilting pop melodies and dreamy ambiance. WHAT SEPARATES THE STIMULUS MUSIC CONCERT FROM OTHER CONCERTS? Stimulus Music fuels independent businesses while promoting music community involvement. HOW CAN I LISTEN TO THE BANDS BEFORE THE SHOW? Click here for more information and tickets to the event.